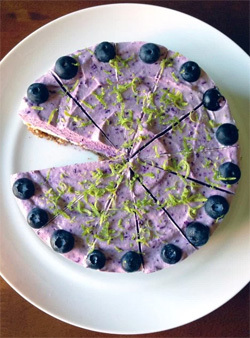 Pretty purple cheesecake that is made from pretty REAL food! Pulse ingredients in food processor until sticky crumbles form. Add a splash of water at the end if it needs help sticking. Press crust into a parchment lined 7″ sprinform pan. The night before, soak cashews in a bowl of water. The next day, drain and rinse. Place cashews in food processor and blend for several minutes until smooth. Scrape down sides and add lime juice, 1/4 cup sweetener, zest, & vanilla & blend again. Stream in the melted coconut oil & blend until well combined. Taste and add more sweetener, if needed. Scoop out enough of the cheesecake filling to cover the crust with about 1/2 to 1 inch of the white layer. Then set in freezer for 30 minutes to firm up. Add 1 cup blueberries to the remaining cheesecake in your food processor and blend until smooth. If your blueberries are tart, you may need a couple more tsp sweetener. Spread the blueberry layer on top of lime layer and decorate with fresh blueberries and lime zest. Cover with foil and set in the freezer for about 3 hours to firm up and then transfer to the fridge for a couple more hours. Use 7″ springform pan to make this cheesecake tall and pretty. If you use a larger pan, your layers and cake will be flatter/shorter.